After last month’s distribution of 230 parliamentary seats won by candidates in Iraq’s provinces, the United Iraqi Alliance (UIA) had 109 confirmed deputies, with supporters of Muqtada al-Sadr forming the largest bloc. The Alliance also received 19 “national” seats, but the allocation of these seats to individual deputies within the alliance was only announced yesterday, on 10 February. Interesting statistics emerge from the distribution of these “national” seats. 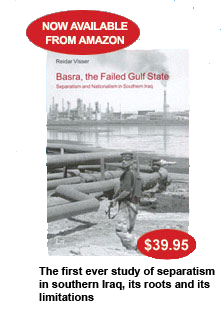 The Supreme Council for the Islamic Revolution in Iraq (SCIRI) and their close allies in the Badr Organisation took no less than nine or almost 50% of the UIA’s 19 seats. The Sadrists gained three seats; Fadila, two; Daawa (Tanzim al-Iraq), one; independents, four. The main faction of the Daawa received no “national” seats. In this manner, SCIRI managed to improve its overall share of UIA seats from 19% to 23%. Figure 2: United Iraqi Alliance seats decided by the coalition leadership between 20 and 22 January 2006 but not made public pending the certification of final elections results. What enabled a single party to dominate this process so markedly? 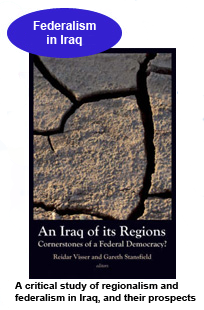 The explanation lies with a little-discussed peculiarity of the Iraqi election system. “National” and “compensatory” seats are common features in countries that practise proportional representation (PR) with multiple electoral districts (instead of a single district). The overarching aim of such devices is to achieve proportionality at the national level and to make up for disproportionalities caused by the use of several districts. In pursuing this goal, the Iraqi system shares features with several other PR systems; there is a particularly close parallel to the model adopted in Bosnia Herzegovina in 2000. But there is also one very important difference in the Iraqi system: here, the list order of the 45 seats awarded on a “national” basis is only decided by the political entities after the elections. (By way of contrast, in Bosnia these “national” lists, while not appearing on the ballots, are supposed to be publicly available in the period before the elections, all in the name of transparency.) The effect is of course that the Iraqi voter whose ballot ends up deciding a “national” seat never had the faintest idea about which candidate the vote would go to, except the name of the party and that it would be someone already on that party’s lists – somewhere on a list, somewhere in the country. Because the sole eligibility criterion for these seats is inclusion, in one way or another, on the list of the relevant political entity, party and coalition leaderships may horse-trade as much as they like with the seats that remain after “governorate” deputies have been named. And the horse-trading among the UIA leadership appears to have been pretty intense. For instead of following any list-based logic, the UIA bosses have promoted relatively obscure SCIRI candidates from places far down on the lists, chiefly in Baghdad and northern Iraq, and thus from positions where they had been unlikely to succeed even if the UIA had performed better than they actually did. Technically, of course, these seats are meant to be “national” ones and thus detached from any geographical considerations. But the weak correlation between awarded seats and candidate electoral performance cannot escape notice. The new SCIRI deputy from Anbar province, for instance, has around 100 “personal” votes behind him, whereas the 300 or so UIA voters in Kurdish Sulaymaniyya were in a sense amply rewarded for their efforts: two representatives to the new Iraqi parliament are from the UIA Sulaymaniyya list – the top Sadrist candidate and another SCIRI member who originally had ranked in fourth place on the ballot. (It should be stressed that these “national” seats are not specifically intended to compensate regions perceived to be under-represented in overall numbers of “governorate” deputies.) Particularly instructive is what happened in Baghdad, where the UIA had 35 confirmed deputies before the distribution of “national” seats. First, number 36 and number 37 (non-SCIRI) on the list were bypassed by the coalition leadership. Numbers 38 through 41 did receive seats (one independent, one Sadrist, two Badr Organisation members), numbers 42 through 44 (non-SCIRI) were passed over, and then three seats were given to two SCIRI/Badr Organisation members and one member of Daawa (Tanzim al-Iraq) further down on the list. A candidate for Hizb al-Fadila (Virtue Party) and an independent placed at the very bottom of the list also received a seat each. In this way, the allocation of “national” seats has been completely detached from the ballot list order (instead of for instance employing a largest-remainders logic, which is often used in PR systems to address the problem of “wasted votes”). More appropriately, these seats could be termed “party seats”, for the electorate has no influence whatsoever on how they are distributed to individual candidates within each political entity. Even after this impressive catch of seats by SCIRI, the internal UIA structure remains multiplex and without any obvious point of gravity. Recent political developments only serve to emphasise this. Complaints about the internal distribution of “national” seats have been loud, with some threatening to leave the coalition. The ongoing contest over the Alliance’s candidate for prime minister has also taken a lot longer than UIA leaders had envisaged; some of the smaller parties such as Hizb al-Fadila have even fielded candidates of their own. And Sadrists have continued protesting against federalism, claiming that the issue should at least be postponed until all foreign forces have left Iraq. 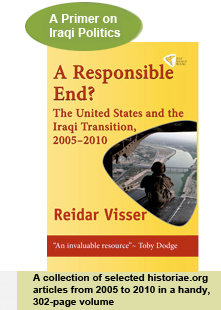 The Sadrist subtext seems to be that the whole course of Iraqi politics today is influenced by the presence of foreign troops (and their powerful diplomats, who are in the habit of paying frequent visits to a highly select pick of Iraqi politicians), and that normal conditions will only come once the external factor diminishes in importance. That point may conceivably even be aimed at the internal politics of the United Iraqi Alliance, where SCIRI is far ahead of everyone else in cultivating bilateral ties with Western embassies. Statistics on deputy affiliations have been compiled from candidate lists issued before the elections by the Independent Electoral Commission of Iraq and the United Iraqi Alliance, and from local newspapers. This document may be freely reproduced as long as http://historiae.org is credited as the source.